I created this recipe because I was in search of a new & exciting way to prepare salmon, versus falling back on the usual & more predictable choices like soy-mustard marinades and teriyaki-style, pineapple-honey-ginger glazes. It's nice to change things up every once in a while! Directions: The following steps can done up to a day in advance: Using a medium-sized mortar & pestle, mash together ginger, garlic, & salt until pulverized. Add shallots & repeat process. Next, mix in red chili powder, amchur, turmeric, coriander, cardamom, cloves, cumin, & black pepper until combined into a thick, uniform paste. Transfer contents into a large mixing bowl. Fold in yoghurt, tomato paste (if using), & the saffron threads that've been soaked in warm milk. Whisk together until well combined. Place salmon into a resealable Ziploc/plastic bag & then pour contents of mixing bowl into bag & tightly seal. Gently massage yoghurt-spice mixture into fish from outside of bag, then place bag into refrigerator, & allow salmon to marinate overnight, or for at least 3-4 hours before grilling. Next, cook the salmon: About 10-15 minutes before cooking, remove the salmon from the refrigerator & set it aside, so that it can reach room temperature before it's cooked, which ensures even heat distribution during cooking. Heat oil in a large (11"), square, nonstick grill pan with a ridged/grooved bottom. When oil is hot, place whole fillet onto grill pan. (Leave fish whole as it's easier to maneuver in the pan when it's a single, large piece.) Pour some of the marinade on top of fish, using a heat-proof pastry brush for even distribution; as fish cooks, continue to coat fish with remaining marinade. To test for doneness, place a knife into the flesh of the salmon & pry it open to see how pink the flesh is on the inside. (I personally like mine to be a medium pink color; tender, but not too fleshy.) 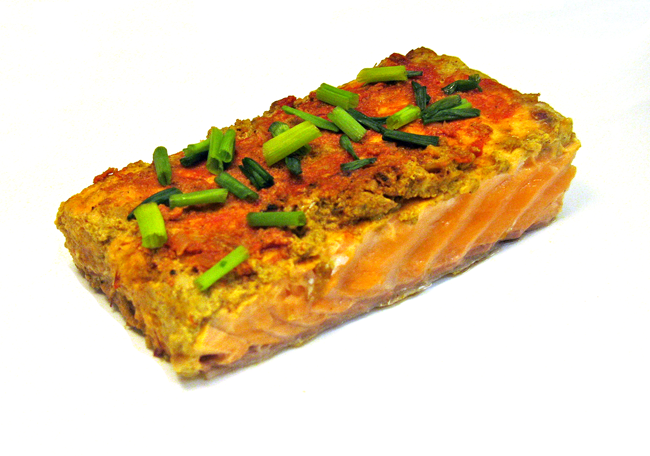 When the salmon flesh flakes with a knife or fork, it's done. Be sure to remove the salmon just as it reaches the flaking point, or it will begin to dry and toughen. Perfectly done salmon is moist, tender, & flaky. When fish is done, cut into 4 equal pieces, transfer to plates, & serve with vegetables, (saffron) rice, & the chutney of your choice. Yield: 4 (4 oz.) servings.